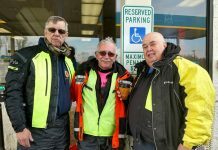 With over one million riding miles under his belt, Harvey Howard III, better known as Howie, has become a highway legend, traveling the country and meeting those that share his love for riding. 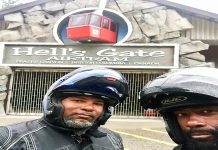 As humble as they come, he’s an old school, traditional biker that enjoys being on the ground so much, that he has never owned a car! Check out what he has to say! GY: HOWIE, WHY DON’T WE START BY YOU INTRODUCING YOURSELF. 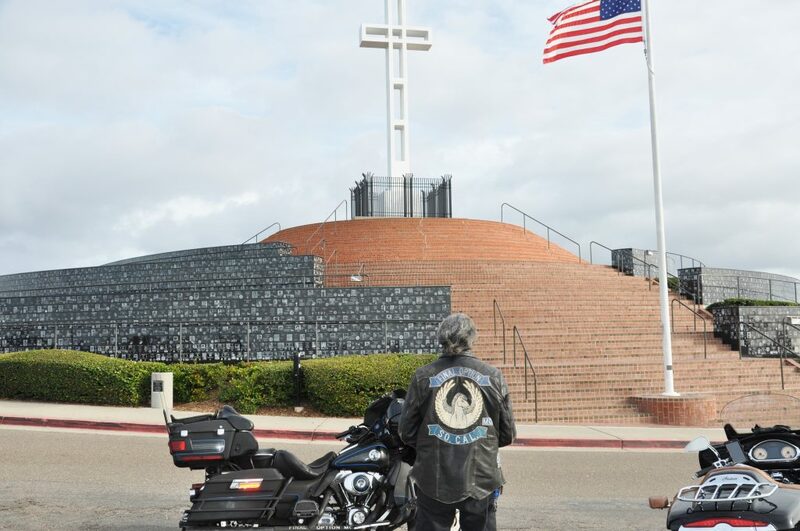 Howie:I’m Howie, from Final Option Motorcycle Club, here in San Diego, California. I’ve been with the club for 26 years. I got patched in December 1990. GY: What do you currently ride? 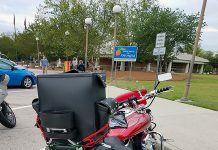 Howie: Currently I have a Harley Davidson 2002 Ultra Classic, with over a quarter million miles on it. Yep, over 250,000 miles on it! GY: GOOD STUFF! HOW LONG HAVE YOU BEEN RIDING? Howie: I got my first bike when I was 15 years old in high school and I’ve been riding ever since. I’ve never owned a car, strictly motorcycles, so I’ve been riding for some time now. So, how many miles would you say you accumulated over the years of you riding? Definitely over a million…..easily a million. I mean, I started out like everyone else riding Honda and Kawasaki motorcycles, which I preferred over the Honda. Then I moved to California and I bought my first Harley in 1985. It was little Sportster and me being 6’4, well…..it was a little small for me. GY: SO OF COURSE THIS MAGAZINE IS CALLED GET YONDER. WHAT DOES THAT MEAN TO YOU? 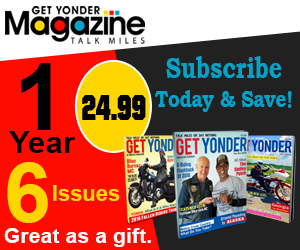 Howie: Getting Yonder means getting out there and doing the damn thing. Getting out on the road and riding. It’s what I love and what I live for. 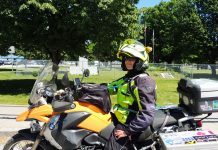 GY: MANY OF THE BIKERS NOW ARE RIDING TO MULTIPLE STATES ON THEIR TRIPS, EVEN ALL 48 IN ONE TRIP. 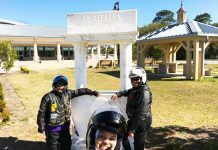 HAVE YOU RODE TO 48 STATES? 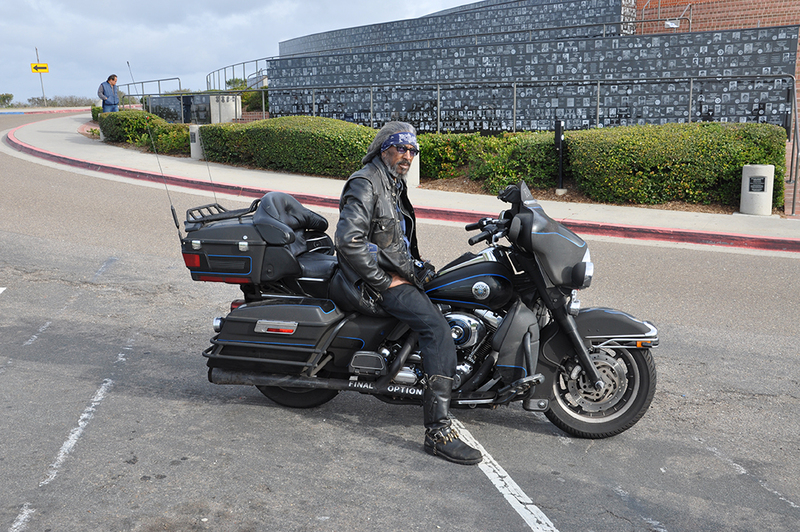 Howie: I’ve ridden to 48 states but not in one trip. Personally, I’m not a biker that likes to plan out their trips. I get on the highway, and I ride. I hit the road pretty often. 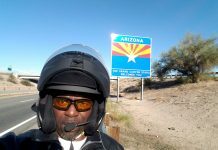 One month, I jumped on my motorcycle and I rode around the country for eight months straight. 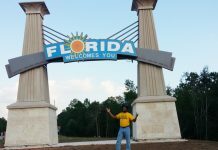 GY: EIGHT MONTHS IN ONE TRIP? Howie: Yea…..just out on the road traveling, with no planning. Just going where I felt like going. When you plan stuff and it doesn’t go right, it leaves you disappointed, so I just show up when I want to. It is what it is when I’m riding. GY: I KNOW YOU’RE CALLED THE AMBASSADOR. HOW DID YOU END UP WITH THIS TITLE? Howie: Well, like I said, I’ve been with Final Option MC for 26 years. I was the club road captain for about 10 years. By the way, road captain has always been my favorite position. Then, I was voted in as president of the club, and I did that for some years, but with president, you know, you get all the headaches. So I finally stepped down as president and was given the title of Ambassador. They gave it to me because I travel the county a lot, meeting people, shaking hands and kissing babies, as I like to call it. Like I told you earlier, I haven’t done anything special….I don’t have no inventions or anything, just a regular old biker that has been around a long time, and keeping it true to this biker lifestyle. There’s not much to me. GY: HAVE YOU EVER BEEN TO ALASKA OR HAVE YOU RODE ANY WHERE OUTSIDE OF THE COUNTRY? Howie: No, I’ve never rode to Alaska, but I did live in Japan for about 4 years. While I lived there, I learned that Harley Davidson is a universal language, because I don’t know any Japanese and they didn’t know any English, other than a little broken English, yet we were able to hang out, ride and communicate pretty well together most of the time. HOW HAVE YOU BEEN ABLE TO SUSTAIN SO LONG AND EVEN AFFORD TRAVELING AS MUCH AS YOU DO? Howie: Well, by no means at all am I a baller or anything like that. I’m able to do what I do mostly because of the people who I meet along the way. There are a lot of good people who put me in or invite me to stay with them when I’m on the road. I try not to overstay my welcome, but I stop by and kick it for a minute with them when I can. But again, I’m not a baller, I try to live within my means. If I have a few dollars in my pocket, let’s kick it and have a good time with the few dollars that I have. I don’t think I have any barriers……I hang out with 99% clubs, 1% clubs, blacks, whites…..cause when you actually sit down and start talking to people, you find that you have a lot more in common than you think. Just stick your hand out and give them a hand shake, and introduce yourself to them. You will get those funny looks sometimes. I can remember a few years back, one time I pulled up to a 1% white club compound, but I got off my bike, and I stuck my hand out and introduced myself. They were looking at me like, “what is he doing here?” But just be respectful and stick your hand out. A hand shake will take you a long way. You just got to show them respect. GY: SO, OUT OF ALL YOUR YEARS OF RIDING, I KNOW YOU HAVE A LOT OF STORIES, TELL US ONE OF YOUR MEMORABLE MOMENTS FROM ONE OF YOUR TRIPS. Howie: Well, I do have a bunch of stories, but off the top of my head…..back in the early 90’s, I was riding cross-country, and me and a couple of guys had just left Sturgis and it was raining really hard. So we pulled up under a bridge to get some shut-eye……so we all were sleeping trying to get a good nights rest, you know doing what we do to survive, and my dad who lives in Ohio…….well him and some of his buddies were on a road trip, and they passed us laying under the bridge not knowing it was us, but told me later that he had passed by and said….”look at them fools up under the bridge sleeping!” It was funny to me when he said it, not knowing I was one of the fools he saw sleeping. But you know on the road, there are always going to be stories. Even the broke down on the side of the road stories. People laugh at me because I carry an umbrella, but I’ve been broke down in the middle of the desert before, and if you’re in 100 degrees plus weather, that little bit of shade will be a life saver. So I always tell people, I always take my shade with me (laughing). GY: SO BESIDES YOUR UMBRELLA, WHAT ELSE DO YOU CARRY ON YOUR TRIPS THAT YOU CONSIDER ESSENTIAL? Howie: I carry tire plugs with me, with a little mini compressor. I’ve used that many times, so if I get a flat tire, I can plug it up, fill it back up with air and get right back on the road. I carry a siphon hose with me, just in case I run out of gas. The funny thing is, I’ve never had to use it, but I’ve been with a lot of people who ran out of gas, so it’s a cool thing to have. I remember helping a couple from Germany one time. They were just sitting on the side of the road, cause they had run out of gas. So I was able to give them some gas. I do have a rule though, if I’m giving you the gas, you’re doing the sucking (laughing)! GY: SO OTHER THAN THOSE COUPLE OF THINGS, DO YOU CARRY ANYTHING THAT MIGHT BE OUT OF THE NORM? Howie: Well, I keep a set of tools too, and I also have a little propane solder iron that I keep in my saddle bag. I had a wire break to my injector, and I was able to solder right on the spot. I’ve never been stranded on the side of the road. You just have to be creative. I broke my ground wire on my battery once, and my bike wouldn’t run, but I went and clipped a piece of fence from the side of the road, because I was in the country at the time, and I was able to wrap it around my battery and around the frame, and hook it right back up. People with Harleys feel like they can only use Harley parts on their motorcycles, but I’m like, dude….we’re just trying to get you back running (laughing). GY: SO IS THERE ANYTHING ELSE YOU WANT TO ADD OR ANY WISDOM YOU WANT TO SHARE? Howie: I wanted to talk about all these new bike clubs. I’m not a real big fan of it, I mean, I’m not one to go around checking no one, but I feel that being a biker is a lifestyle, not just a weekend thing. You can’t say, oh it’s Saturday, let me put my leather on. You aren’t born with leather and boots on. So at some point you have to sit down and learn about the biker lifestyle. When you get 5 guys together and start a new club, you’ve missed out on prospecting, which is the most important part. You’ve missed out on being around some OG’s that could have schooled you on the do’s and don’t of being in a club. I live this life, like I said, I’ve never own a car in my life. I’ve always been on the ground and this is what I do! 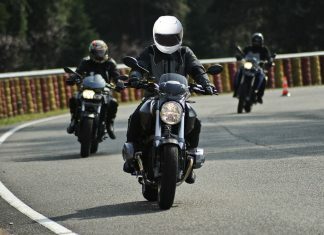 May: Motorcycle Safety Awareness Month! What Can I Do?